Please join us at the events listed below. 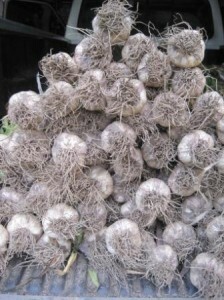 Shoot us an email on our contact us page if you’d like to pre-order any garlic. It’s fresh and juicy! We can ship anywhere. Sixth annual Minnesota Garlic Festival Saturday, August13 at the McLeod County Fairgrounds in Hutchinson. If you haven’t been, you should come. See link on side for more information. The chef demos look great. Minnesota Renaissance Festival on August 20 and 21 in Shakopee. Look for the “garlic garlic garlic” banner. Red Wing Farmers’ Market in later August and September. See link on side for more information. Working with garlic is a delight. There are 28 varieties this year to try, each with its own flavor and delightful juiciness. And who said all garlic is the same. Ha.